Thank you for your interest in the Gartner Managed M2M Services report. You'll be redirected to the asset in another tab. Click here to go there now. Thank you for your interest in the Gartner Report on Network Services. You'll be redirected to the asset in another tab. Click here to go there now. Thank you for your interest in the Gartner report on Managed Security Services. You'll be redirected to the asset in another tab. Click here to go there now. We were named a Leader for our ability to execute and completeness of vision. As defined by Gartner, "managed machine-to-machine (M2M) services enable businesses to collect, analyze and interact with data streams, thus providing businesses with the ability to monitor, manage and control (manually and through automation) assets associated with business processes. Managed M2M services may encompass integrated and managed IT infrastructure and systems, OT infrastructure and systems, software, network services (connectivity), and IT services." Gartner recommends "CIOs building IoT-enabled businesses can use this document to assess vendors for multiregional connectivity and value-added services to support outcomes." While we have had the honor of being named a 'Leader' by Gartner before, in the 2018 report, AT&T moved up on the quadrant in our ability to execute. We believe the significance of that improvement is vital to IoT. There are many vendors, but proofs-of-concept often stay on the ground. The IoT ecosystem we have developed helps customers with a full suite of modular solutions, with best-in-class alliances and collaborations in a one-stop IoT development shop. Our value-added solutions are based on strong platforms that simplify multiple aspects of M2M and IoT solutions and enable our customers to scale when they need to. For example, AT&T Multi-Network Connect aggregates third-party data feeds from partner networks and systems for a single view of M2M inventory management. Also, the AT&T IoT platform offers a range of capabilities including storage and data management, an open-source application development and management environment, and pre-integrated data connectors to data analytics services. For more information about our IoT Solutions, please click here. 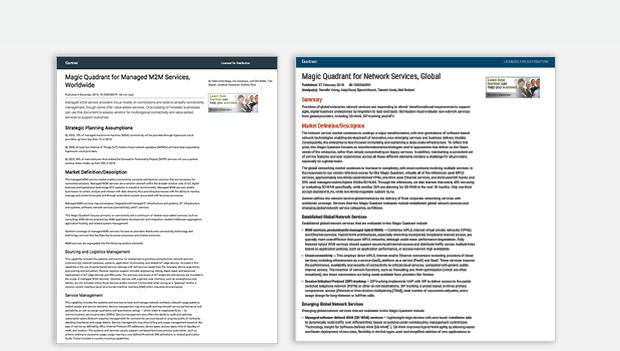 Read the full Gartner report on Managed M2M Services. Leading analyst and research firm, Gartner Inc., names AT&T a Leader in its 2018 Magic Quadrant for Network Services, Global, for the 14 consecutive time. 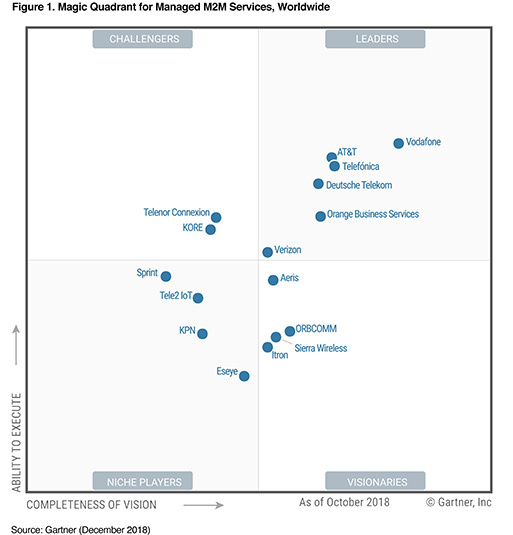 In this Magic Quadrant, Gartner evaluated global enterprise network service providers' "ability to execute" and "completeness of vision". The report states, "The network services market continues to undergo a major transformation, with new generations of software-based network technologies enabling development of innovative, new emerging services and business delivery models. (....) To reflect this pivot, this Magic Quadrant focused on transformational technologies and/or approaches that deliver on the future needs of the enterprise, rather than simply concentrating on legacy services." Gartner defines the network service global market as the delivery of fixed corporate networking services with worldwide coverage. Services evaluated include established global network services and emerging global network service categories: WAN services, cloud connectivity, SIP trunking, SD-WAN services, network on-demand services, NFV services, and virtual CPE. In the past 12 months, Gartner has seen accelerated change in enterprise requirements and buying criteria for global networks. Enterprises are increasingly focusing on agility, their adoption of cloud services and greater use of the internet as primary WAN transport. Enterprises are piloting and deploying new services such as managed SD-WAN, network on-demand services, NFV and vCPE to improve the agility of their WANs. As a result, the inclusion and evaluation criteria for this year's Magic Quadrant, although similar to the prior year's research, has been adjusted to reflect these trends. For more information about our Network Services, please click here. Read the full Gartner report on Network Services. We were named a Challenger for "Completeness of Vision" and "Ability to Execute" in the Managed Security Services category. Gartner defines Managed Security Services as "the remote monitoring of security events and security-related data sources, or the management of IT security technology along with security event monitoring, delivered via shared services from remote Security Operations Centers, not through personnel on-site nor remote services delivered on a one-one basis to a single customer." 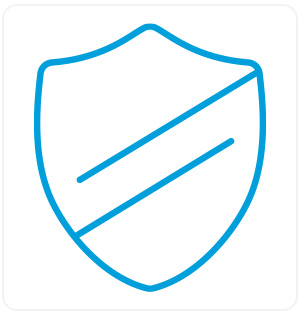 AT&T continues to develop Managed Security Services and solutions that help companies worldwide with cybersecurity, threat detection, security technology management, compliance concerns, network intrusion detection and prevention, security gateways, monitoring and reporting, firewalls, endpoint protection platforms, and so much more. For more information about our Security Solutions, please click here. 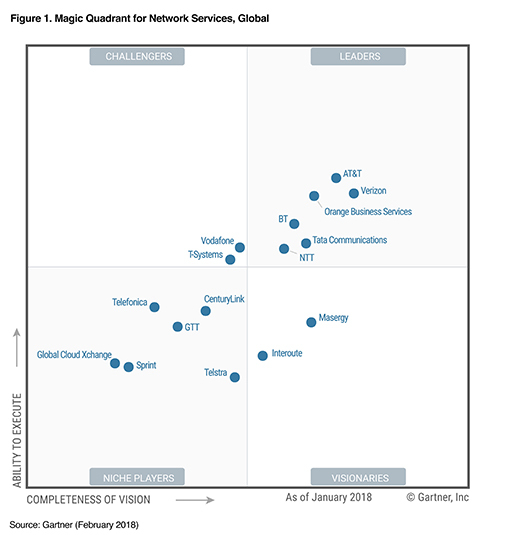 Gartner Magic Quadrant for Network Services, Global, Danellie Young, Katja Ruud, Bjarne Munch, Takeshi Ikeda, Neil Rickard, 27 February 2018. Gartner Magic Quadrant for Managed Security Services, Worldwide, Toby Bussa, Kelly M. Kavanagh, Sid Deshpande, Pete Shoard, 27 February 2018. Gartner does not endorse any vendor, product or service depicted in its research publications, and does not advise technology users to select only those vendors with the highest ratings or other designation. Gartner research publications consist of the opinions of Gartner's research organization and should not be construed as statements of fact. Gartner disclaims all warranties, expressed or implied, with respect to this research, including any warranties of merchantability or fitness for a particular purpose. The graphics were published by Gartner, Inc. as part of larger research documents and should be evaluated in the context of the entire document. ©2019 AT&T Intellectual Property. All rights reserved. AT&T, the Globe logo and other AT&T marks are trademarks and service marks of AT&T Intellectual Property. All other marks are the property of their respective owners. The information contained herein is not an offer, commitment, representation or warranty by AT&T and is subject to change. For more information regarding our solutions, please fill out the form below and an AT&T solutions specialist will contact you. Thank you for contacting us. An AT&T Representative will contact you to provide additional information regarding our solutions.